Artificial turf is commonly used on sports fields, but it's becoming popular as a home lawn option as well. Durable and drought-resistant, synthetic grass not only stays eternally green but mimics the slight, gentle give that natural grass offers. In some types of artificial turf, that give occurs because the polyethylene grass blades are anchored in black rubber granules. Artificial turf companies vary slightly in how they design their turf, but in general, synthetic fibers made of polypropylene, nylon, polyethylene or a combination of those materials are woven together to mimic natural blades of grass. The woven material or even individual blades are then fastened to a backing. Then the space between the backing and artificial grass is filled with a base material designed to provide a cushion. 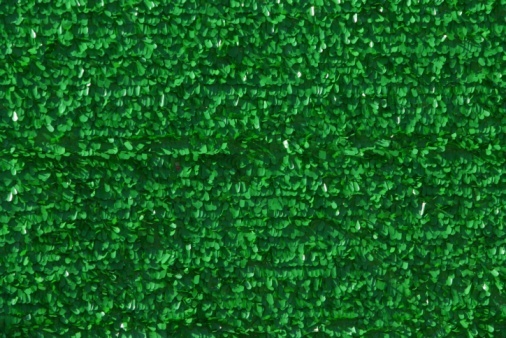 The artificial turf's base material, or infill, is composed of granules of soft plastic pellets, sand, silica sand, crumb rubber or a combination of those materials. The crumb rubber is usually composed of recycled tires, and that is what makes up the black material in some artificial turf. Old tires present an environmental problem. One way to solve the problem is to recycle them, and a common way to do that is to grind them and use the resulting fine material as mulch, in rubber playground mats and as artificial turf infill. When exposed to rain, sunlight and the constant pressure of athletic shoes, the rubber in some artificial turf oxidizes and releases toxic chemicals that can have adverse health effects on people and animals. Tires contain chemicals that prevent them from being legally dumped into landfills and oceans, which is why they pose an environmental problem. Some people think it doesn't make much sense for tires to be made into pellets and then used in public places where people will play, lie on or even just walk over them. Several studies have concluded, however, that the chances of health risks arising from exposure to rubber granules or crumbs in artificial turf is low, according to a March 2008 article in "Environmental Health Perspectives." Homeowners who want to install artificial turf but are concerned about the potential safety and environmental issues surrounding the use of its rubber granules can choose other options. Some artificial turf companies use plant-based materials instead of recycled rubber for their infill; those plant-based materials include cork and shredded coconut husks. Other companies are turning to nontoxic thermoplastic materials. In addition, many tire companies work to reduce the amount of chemicals used to create their tires so that when the tires are recycled, the end product will not contain potentially harmful toxins.